When examining metals, the sea of electrons model can be used. The positively-charged core of a metal, consisting of its nucleus and core electrons, is generally stationary, while the valence electrons on each atom do not belong to a specific atom and are very mobile. These mobile electrons explain why metals are such good conductors of electricity. The delocalized structure of a metal also explains why metals are both malleable and ductile, as deforming the metal does not change the environment immediately surrounding the metal cores. Metals can also bond with each other to form alloys. This typically occurs when two metals are melted into their liquid phases, and are then poured together before cooling and creating the alloy. In an interstitial alloy, metal atoms with two vastly different radii combine. Steel is one example; the much smaller carbon atoms occupy the interstices of the iron atoms. 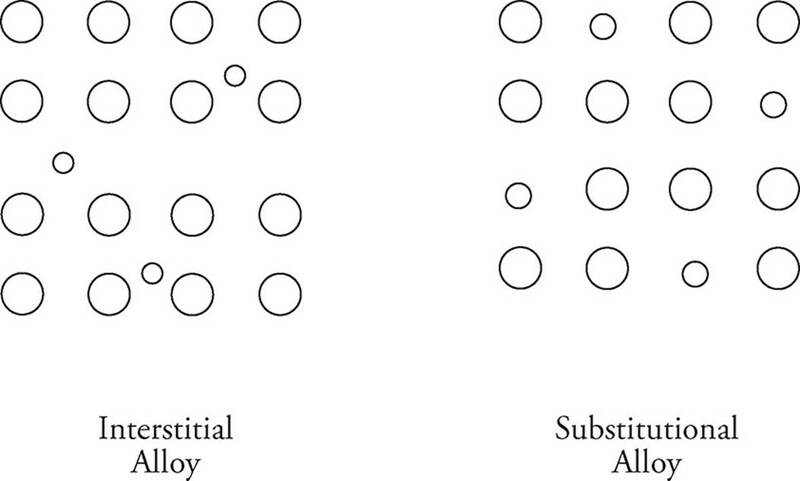 A substitutional alloy forms between atoms of similar radii. Brass is a good example, atoms of zinc are substituted for some copper atoms to create the alloy.